What is a ZIP+4 Database? Every U.S. street and address range, with its related 9 digit ZIP code, put into row and column CSV format for easy use and manipulation. With over 50 unique fields of information and every 9 digit ZIP code in the United States, it gives you an unlimited number of ways to analyze all the U.S. ZIP +4 information. Our ZIP plus 4 Database is a great tool for address verification, building websites, geotargeting, sales tax, and general analysis. Has every street name and house number range in the U.S.
* The Standard database Lat/Lon & Census Tract/Block coverage is approximately 60% of available coordinates. † The Premium database Centroid Lat/Lon & Census Tract/Block Group coverage is approximately 80+% of available coordinates. ‡ The Deluxe database Centroid Lat/Lon & Census Tract/Block Group coverage is approximately 95+% of available coordinates. 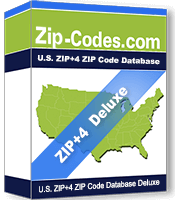 There are different license's and license types for the Standard and Deluxe ZIP+4 ZIP Code Databases. Designed for use within your organization. Designed for use in a distributed product or service outside your organization. Designed for all types of use. Our ZIP+4 ZIP Code Databse is approximately 1,000 Mb in size and contains over 45 million records. ZipCode 00000-99999 Five digit numeric ZIP Code of the area. UpdateKey A unique key number identifying this record for updates. Action A or D, meaning add or delete this record. RecordType A flag indicating which type of record this is. Ex: Firm, General Delivery, High Rise, PO Box, Rural Route, or Street. CarrierRouteID Carrier identification code or number for a given delivery route or PO box presentation. StPreDirAbbr The directional abbreviation that comes before an address: Ex: The N meaning North in "N 123 MAIN ST"
StName The official name of the street as assigned by a local governing authority for this record. StSuffixAbbr Code that is the standard USPS abbreviation for the trailing designator in a street address. StPostDirAbbr A geographic direction that follows the street name. Ex: The N meaning North in "123 MAIN ST N"
AddressPrimaryLowNumber The low number in a range of numeric or alphanumeric components to an address preceding the street name. AddressPrimaryHighNumber The high number in a range of numeric or alphanumeric components to an address preceding the street name. AddressPrimaryOddEven Code that identifies the side or sides of a street for which a given address range is applicable. BuildingFirmName The name of a company, building, apartment complex, shopping center, or other distinguishing secondary address information. AddressSecondaryAbbr Only Applicable to Record Types F and H.
AddressSecondaryLowNumber The low-end secondary address component in a range of secondary addresses. AddressSecondaryHighNumber The high-end secondary address component in a range of secondary addresses. AddressSecondaryOddEven Code that identifies the side or sides of a street for which a given address range is applicable. Plus4Low ZIP Add-On Low Number in the range. Also known as the +4. Plus4High ZIP Add-On High Number in the range. Also known as the +4. BaseAlternateCode Code that specifies whether a record is a base (preferred) or alternate record. GovernmentBuilding This indicates what type of Government building this is if applicable. FinanceNumber A code assigned to Postal Service facilities (primarily post offices) to collect cost and statistical data and compile revenue and expense data. State A 2-character abbreviation for the name of a state, U.S. territory, or armed forces ZIP Code designation. CountyFIPS The 3-digit (FIPS) code assigned to counties in sequence within each state. CongressionalDistrict The 115th Congressional District this ZIP+4 record is assigned to. Municipalitykey Reserved for future use. UrbanizationKey An index to the ZIP Code Database CityStateKey file that provides the urbanization name for this delivery range. PreferredLastLineKey Match this field to our ZIP Code Database CityStateKey for City name, City alias, Area Code, TimeZone, and more. ToLatitude The north/south measurement indicating the beginning for this record. FromLatitude The north/south measurement indicating the beginning for this record. ToLongitude The east/west measurement indicating the beginning for this record. FromLongitude The east/west measurement indicating the beginning for this record. CensusTract Small, locally delineated statistical areas within selected counties, generally having stable boundaries and, when first established by local communities, designed to have relatively homogeneous demographic characteristics. CensusBlock Blocks are numbered uniquely within each census tract with a 4-character number that identifies the collection block used in the census and a character block suffix. This character block suffix is often blank. TLID Tiger Line Identification (TLID) is a universal number associated with Census Bureau products. Note: Approximately 40-50% of records in the STANDARD Database do not contain Latitude/Longitude data; This is partly due to the fact that many are "point" ZIP Codes which have no geographical boundaries. Examples include: P.O. Box Only, Military, Single Business, and Government ZIP Codes. Any remaining missing Lat/Lon data is a function of the Tiger data always trying to play "catch up" with the U.S. Postal Service changes. For more complete coverage, please see the DELUXE Database. UrbanizationKey An index to the USPS City State file that provides the urbanization name for this delivery range. PreferredLastLineKey Match this field to our ZIP Code Database for City name, City alias, Area Code, TimeZone, and more. ToLatitude The north/south measurement indicating the end for this record. ToLongitude The east/west measurement indicating the end for this record. Zip Code 5 digit zip code as designated by the United States Postal Service. City City name as designated by the United States Postal Service. County County or parish name where the ZIP Code resides. Area Code Telephone area code(s) of the particular postal zone (ZIP Code). City Type Describes the type of postal station in the "City Alias" field. City Alias Abbr. Abbreviation of city alias where applicable. City Alias Name The alias name for the ZIP Code. This may be a city name, postal entity, community or a municipality name. Latitude The geographic coordinate of a point measured in degrees north or south of the equator. Longitude The geographic coordinate of a point measured in degrees east or west of the Greenwich (prime) meridian. Time Zone Time zone designation within the U.S. - the numbers 4-11 are assigned to the time zones. Elevation The county's average elevation. County FIPS The 3-digit (FIPS) code assigned to counties in sequence within each state. Daylight Savings Flag indicating whether a zip code is on daylight savings. PreferredLastLineKey Matches this record to our other products for designated city name, city type, area code, time zone, and more. State 2 letter state name abbreviation. StateFullName The full US State Name. City Name of the city as designated by the USPS. CityAliasName Alias name of the city if it exists. County Name of County or Parish this ZIP Code resides in. AreaCode The telephone area codes available in this ZIP Code. Latitude Geographic coordinate as a point measured in degrees north or south of the equator. Longitude Geographic coordinate as a point measured in degrees east or west of the Greenwich Meridian. Elevation The average elevation of the county. CityType Indicates the type of locale such as Post Office, Stations, or Branch. CityAliasAbbreviation 13 Character abbreviation for the city alias name. CountyFIPS FIPS code for the County this ZIP Code resides in. StateFIPS FIPS code for the State this ZIP Code resides in. TimeZone Hours past Greenwich Time Zone this ZIP Code belongs to. DayLightSaving Flag indicating whether this ZIP Code observes daylight savings. ClassificationCode The classification type of this ZIP Code. MultiCounty Flag indicating whether this ZIP Code crosses county lines. CityAliasCode Code indication the type of the city alias name for this record. Record can be Abbreviations, Universities, Government, and more. PrimaryRecord Character 'P' denoting if this row is a Primary Record or not. Absence of character denotes a non-primary record. HouseholdsPerZipcode The estimated number of households of the ZIP Code based on 2010 Census data. PersonsPerHousehold The estimated average number of persons per household of the ZIP Code based on 2010 Census data. AverageHouseValue The average house value in County based on 2010 Census data. IncomePerHousehold The average household per ZIP Code based on 2010 Census data. Population The population of the ZIP Code based on 2010 Census data. WhitePopulation The estimated White/Caucasian Population of the ZIP Code based on 2010 Census data. BlackPopulation The estimated Black/African American Population of the ZIP Code based on 2010 Census data. HispanicPopulation The estimated Hispanic Population of the ZIP Code based on 2010 Census data. AsianPopulation The estimated Asian Population of the ZIP Code based on 2010 Census data. HawaiianPopulation The estimated Hawaiian or Pacific Islander Population of the ZIP Code based on 2010 Census data. IndianPopulation The estimated American Indian and Alaska Native Population of the ZIP Code based on 2010 Census data. OtherPopulation The estimated Population of all other races for the ZIP Code based on 2010 Census data. MalePopulation The estimated Male Population of the ZIP Code based on 2010 Census data. FemalePopulation The estimated Female Population of the ZIP Code based on 2010 Census data. MSA Metropolitan Statistical Area number assigned by Census 2010. MSA_Name Primary Metropolitan Statistical Area name or Title. PMSA Primary Metropolitan Statistical Area Number. PMSA_Name Primary Metropolitan Statistical Area name or Title. CSA Core Statistical Area. This area is a group of MSA's combined into a population core area. CBSA Core Based Statistical Area Number. CBSA_DIV Core Based Statistical Area Division. CBSA_Type Core Based Statistical Area Type (Metro or Micro). CBSA_Name Core Based Statistical Area Name or Title. MailingName Yes or No (Y/N) flag indicating whether or not the USPS accepts this City Alias Name for mailing purposes. PreferredLastLineKey Links this record with other products ZIP-Codes.com offers. CityStateKey Links this record with other products ZIP-Codes.com offers such as the ZIP+4. CityMixedCase The city name in mixed case (i.e. Not in all uppercase letters). CityAliasMixedCase The city alias name in mixed case (i.e. Not in all uppercase letters). StateANSI ANSI code for the State this ZIP Code resides in. CountyANSI ANSI code for the County/Parish this ZIP Code resides in..
FacilityCode The type of locale identified in the city/state name. CityDeliveryIndicator Specifies whether or not a post office has city-delivery carrier routes. CarrierRouteRateSortation Identifies where automation Carrier Route rates are available. FinanceNumber A code assigned to Postal Service facilities. UniqueZIPName Field that specifies whether the City State Record contains the organization name for a unique ZIP Code. The ZIP+4 database is a large dataset (over 1 GB compressed). Because of this large size, the data is broken down into 62 individual files (one for each state/territory). Each file contains the full data for the given state. Below are the State files available as well as their current Compressed and Uncompressed File Sizes. All files are delivered in compressed .ZIP format.